Book News: Indie Bookstores Don't Take Kindly To Amazon's Kindle Offer : The Two-Way Also: Nuyorican poet Tato Laviera dies at age 63; Alexis Madrigal on the new Dave Eggers novel; an interview with Graywolf Press. One bookseller says of the new Amazon Source program to sell Kindle e-readers: "That's not cooperation. That's being complicit in your execution." 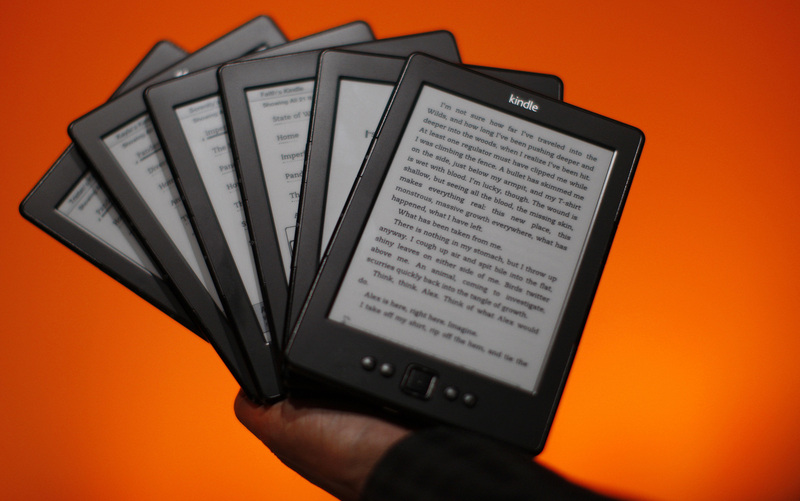 Amazon is asking independent bookstores to sell Kindles in exchange for 10 percent of the revenue from ebooks bought on the devices for two years. But the offer, under a program called Amazon Source, has been met with widespread derision. Suzanna Hermans, president of the New England Independent Booksellers Association and one of the owners of Oblong Books & Music, tells Publisher's Weekly, "If Amazon thinks indie bookstores will become agents for the Kindle, they are sorely mistaken," adding that "there is no way I will promote Amazon products in my stores after the havoc they have wreaked on our industry as a whole. Sorry, Jeff. I'm not buying it." Many bookstores already sell the Kobo e-reader, but Amazon is a harder sell because of its reputation for predatory pricing. Amazon lists two Washington state bookstores that have already signed up for Source: University of Puget Sound Campus Bookstore and JJ Books. Jason Bailey, co-owner of JJ Books, writes in a testimonial, "Kindle will help us bridge the evolution of the bookstore into the Internet age." Amazon did not respond to a question about whether any other stores have signed up, but it seems many booksellers share the view of J. B. Dickey of the Seattle Mystery Bookshop, who tells The New York Times, "That's not cooperation. That's being complicit in your execution." Nuyorican poet Tato Laviera, who wrote in English, Spanish and what he called "spanenglish," died Friday at the age of 63. The New York Times writes, "His acclaimed poems and plays captured the rhythms and language of Puerto Rico and the Lower East Side — his twin loves — with equal measures of protest, playfulness and hope." At The Atlantic, Alexis Madrigal criticizes Dave Eggers' new novel, The Circle: "I found myself profoundly disappointed that Eggers took on these complex, difficult technologies, which we spend a lot of time thinking about, but refused to reckon with their real seductiveness. To only take on the easy-to-jeer stuff in social media is, more than anything, just a terrible failure of imagination for a book that wanted so deeply to be unnerving and new." The New York Times interviewed Jeffrey Shotts and Fiona McCrae of independent publisher Graywolf Press about poetry, what they look for in submissions, and books they wish they had published: "Another book that would be a wish from the last five years is the most recent poetry by Liu Xiaobo. Instead, he has been imprisoned in China for those five years, and is to serve a total of 11 years — incarcerated for 'an incitement to subvert state power.' His poetry is raw, angry, the work of his activism and long memory. His voice is essential. It deserves to be heard."